This was amazing! The Tenors provided a great show and the dancers were a great compliment to the singers. Highly, highly recommend attending. If you go during late fall, winter - dress warm! The venue is a grand Episcopal church but it was cold inside. I suggest bringing coats, hats, gloves - even a blanket. The pasta was great - not really a full meal but it was enough. Drinks were extra so bring extra money. What a delightful concert!! The singers and musicians were wonderful and dancers a lovely addition. The audience participation and contact with the singers was fun! Thank you for a delightful time. Regarding the food, please just don't offer it. It takes away from the event...paper plates, plastic forks, only one small appetizer size plate of non special pasta...really not needed. Unless you are going to offer a beautiful buffet or cold cuts and cheese for example, don't bother serving food, I recommend. 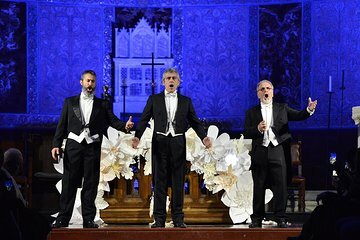 The music tenors were fabulous, amazing how they needed no microphones. Keep in mind it is a taste of pasta. Do not think you are getting dinner. You eat spicy pasta sitting in a chair, glass of wine is 5 euros. Three dancers throughout the show I thought somewhat distracting.